Amazing things can happen when you marry comfort food with quirk. After all, isn’t that how we came up with bacon chocolate and Korean tacos? Greatness isn’t always guaranteed though, at least, not at Wonderdog. We don’t just say that because the fries in the combo (additional $10) are stone cold upon arrival – but because the dogs here are far from blue ribbon winners. There are nine styles, all tricked out in tongue-in-cheek fashion. You can opt for a beef frankfurter or pork weiner, though it doesn’t really matter since the folks here bury it all under a deluge of condiments. The ‘classic with a twist’ ($46) is drowned in an overly plucky mash-up of ketchup, relish, mustard and ‘wonder sauce’ (similar to thousand island dressing). 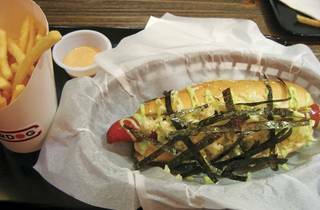 There’s also the ‘devil dog’ ($58), which comes with a warning that its ‘friggin’ spicy’ (as the menu words it). This has the potential to be good times for those who enjoy some heat on their dog but the habanero sauce is so intense it literally stings the skin. It doesn’t help that this hell hot paste is smeared across the entire surface of the bun. Proceed with caution. We also try the ‘nori nori’ ($58), which is far less exciting than its kawaii name suggests. 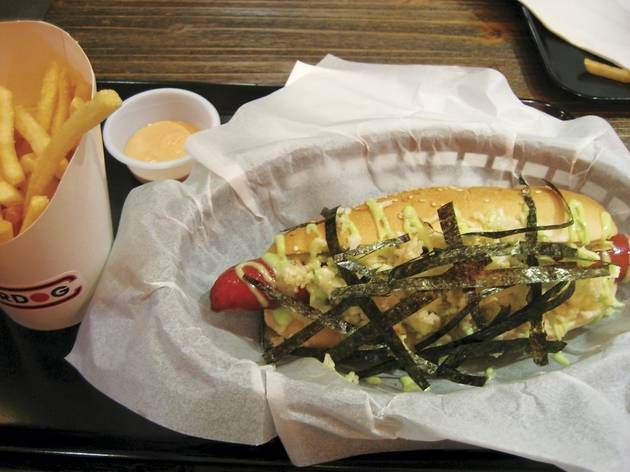 It’s slicked in wasabi mayo – a nice touch if only the flavour were more prominent. Puffed rice is added for textural pop but the effect of these tasteless bits is more annoying than anything. 12 Haven St, Causeway Bay, 2886 8052; www.wonderdoghk.com. Daily 11am-10pm. Dinner for two: around $150.